Windows are getting larger and larger, thus the need for this article. Some may enjoy the beauty of the window itself, but others will want to soften the view or need privacy and protection from glare. Let's look at solutions for covering your large window with window treatments. Personally I enjoy the lush, fullness of fabric. Windows are a focal point so don't skimp, and you'll take a large window from good to great! 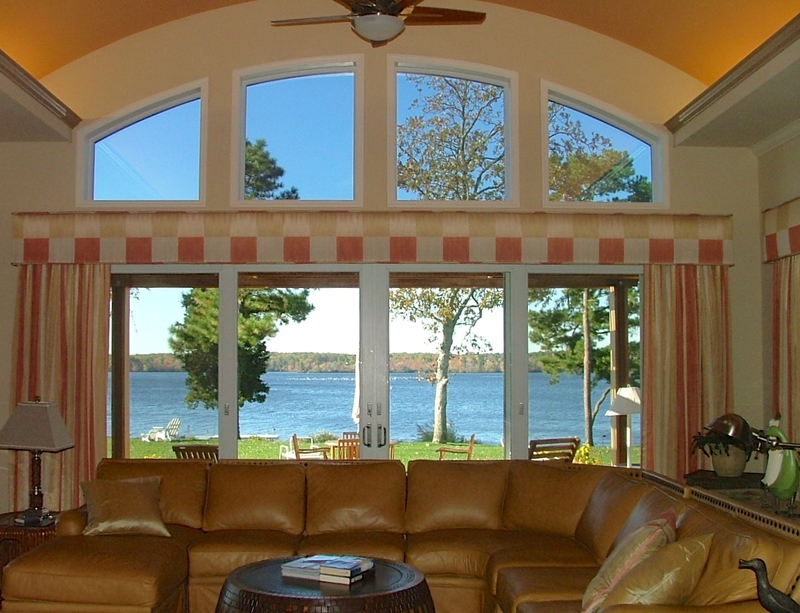 A properly treated window can have a huge impact upon the overall feel of a room. Think more about framing your large window enabling you to enjoy the light, air and view. For privacy and light control a less expensive shade can be installed under the panels. Remember to keep the panels in proportion to the window span, the larger the window the greater the need for fullness of the stationary panels. 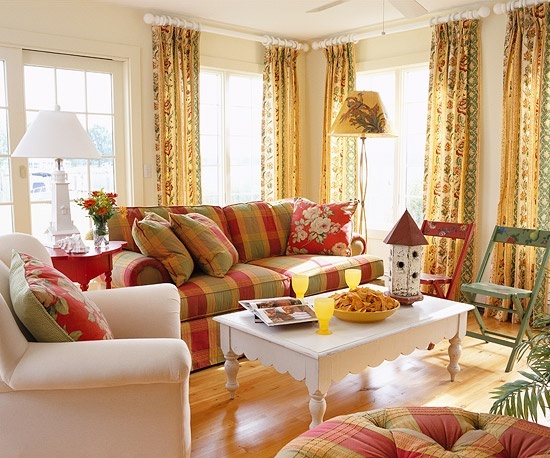 Don't shy away from bold prints on large windows, the stunning print will enhance the beauty of a larger window. Also, a room visually grows in height and width when mounting the panels as close to the ceiling as possible. This is so important for ceiling heights that are in the 8 to 9 foot range. Roman shades are another option for the larger window. 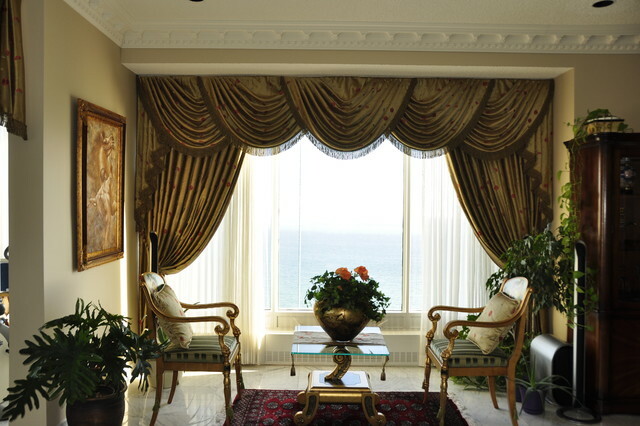 This type of window treatment can be made stationary or fully operational. The softness of fabric or the repetition of a pattern will bring a cohesiveness to the interior design project. Stripes are not a required Roman shade fabric. An important tip would be to choose a fabric that can be railroaded (turned - using the fabric length) this will often times eliminate a vertical seam. Horizontal seams can easily be hidden within the folds of the Roman shade. Consider adding side panels to a shade increasing the richness of your window treatment. Occasionally everything is in alignment; your window is perfectly oriented in-regards-to the sun, the view is worth preserving, privacy is not an issue and furnishings are not in jeopardy of fading. Then the less-is-more approach works very well. 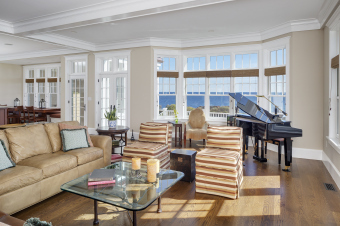 Let the architecture of the large windows and the view bring interest to the living space. 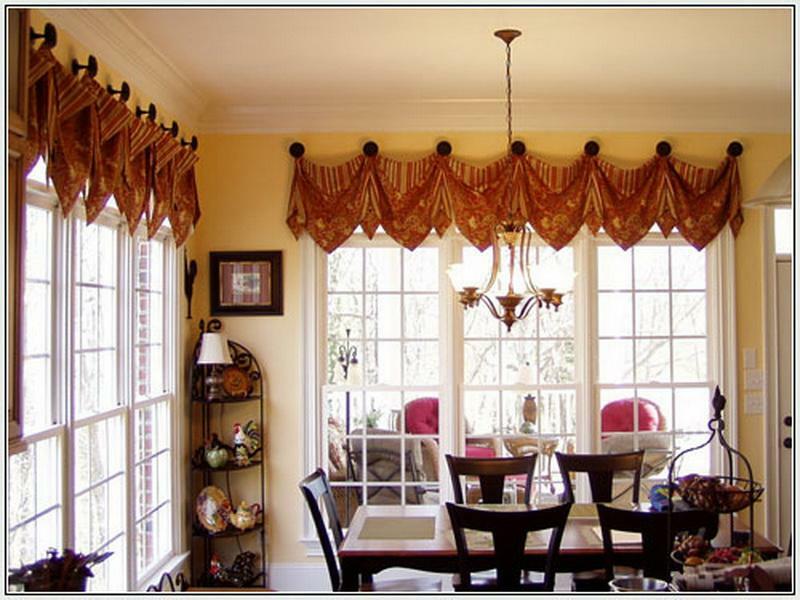 Board mounted valances or padded cornices are a simple option that help guide the eye upward. Careful consideration must be given to the overall height of your valance. While there is no standard height for this situation, there is a height that will create balance and harmony within the room and the span of the window you are decorating. 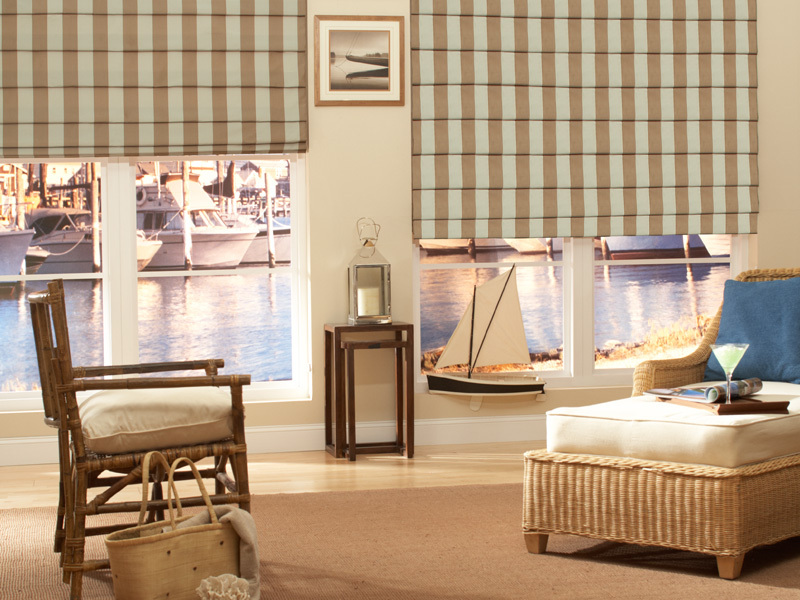 A trained interior designer may be a wise investment for even the simplest of window fashions. A formal approach to dressing the large window is with swags and jabots. These can have many adaptations. Swags typically look best in odd numbers and it is important that they are in proportion to the window height and width. The swag may be contrast lined and mounted over or under overlap or touching. Did you know there are various swag pleat styles? The swag may also be pole mounted with open or closed swags and board mounted with a closed swag. To which you may want to add a band, fringe or beaded trim. The jabots or cascades can also be contrast lined, they can be wide stacked, reversed first pleat, pleated, gathered, fanned or spiral. I think you get the picture, there is a lot to know about swags. Check back for a complete article on swags and jabots. What we can agree on now is that swags are more formal, look good in odd numbers and should always be made in individual pieces and mounted to look as if they are continuous. Let's end with traversing sheers on the large window. Depending on the opacity and fullness, sheers will not provide total privacy. You may use a heavier weight fabric that is lined and more opaque, in which case it will be important to use a heavy duty rod as the weight of the drapery can put strain on your operating mechanism. If using a motorized rod you will also need to consider the overall weight of your drapery. Drapery fullness is minimally 2.5:1 but for sheers it is not uncommon to use 4:1 fullness depending on the look you are trying to achieve. Rods may be ceiling mounted, decorative, motorized or standard traversing. Just like their cousin the drapery panel traversing draperies look stunning mounted at the ceiling. Along with fabric selection you will want to consider a pleat style. Do you want classic pinch pleat, goblet, Bohemian, grommet, shirred, three-finger pleat or pencil pleat. This is why I enjoy designing window treatments, no two are alike and there are many options, giving you a truly custom window treatment.